Monday night saw Juventus easing their way to a 3-0 win over Chievo Verona to maintain their lead at the top of the Serie A table. Douglas Costa registered an incredible 20-yard strike in the first half to give the hosts the lead early on. This was followed by an easy Emre Can finish to double the lead just before half-time. Finally, a Daniele Rugani header late in the second half secured what was a comfortable win for the Bianconeri. The win restored the side's nine-point lead at the top of the league table. The table-toppers will hope to extend the lead further when they face Lazio next Monday. 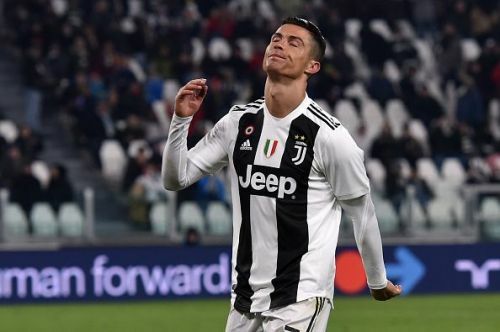 While the victory was crucial for Juventus to restore their lead, a missed penalty by Cristiano Ronaldo stole the headlines at the end of the game. The Portuguese was given a chance to triple the lead early in the second half after a Mattia Bani handball inside the box. However, the Chievo shot-stopper, Sorrentino, denied the attempt, much to the forward's dismay. Juventus boss, Massimiliano Allegri, downplayed the miss, stating that this will not be the only time his star recruit will miss a penalty. "Important penalties are others … it can happen to miss a penalty." "I don't think this is the first time that Ronaldo misses a penalty in his career. The most important thing is that the team won the game at the end." "He (Ronaldo) wanted to score and in the second half technically played much better. In the first half, he was rushing too much to find the net. In the second part of the match, when he played easier football, he had two or three good goal occasions." Twitter has since reacted to the incident. and Ronaldo has just lost his bet with Allegri - which was to score every penalty this season. Ronaldo's debut for Juventus: Good or Bad?